(Reuters) - The Trump administration on Friday amended Obama-era land-use rules put in place to protect a threatened bird in 11 Western states and its shrinking sagebrush habitat, siding with oil and gas interests that opposed the measures as too restrictive. Conservation groups denounced the move as a handout to the oil and gas industries, while an industry group praised it. The new rules, announced by the Department of Interior's Bureau of Land Management, fits within the Trump administration's broader plan to increase energy production on federal lands by loosening environmental regulations. 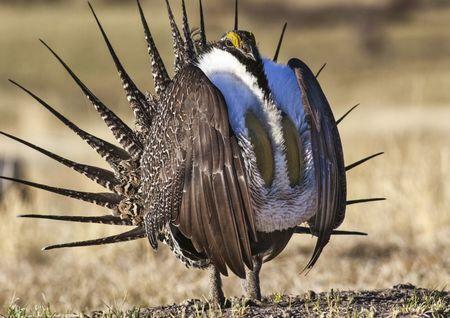 Former President Barack Obama's 2015 plan to protect the ground-dwelling sage grouse imposed restrictions to development in their habitat but fell short of placing the bird on the endangered species list, which would have imposed far more rigid rules. In 2017, the DOI ordered a review of protections for sage grouse to "ensure conservation efforts to not impede local economic opportunities." Of the 11 Western states included in the 2015 plans, seven opted for changes, according to BLM. They include California, Colorado, Idaho, Nevada, Oregon, Utah and Wyoming. The governors of all of those states except California said in statements that they supported the plan amendments. Montana, North Dakota and South Dakota opted out of amending their sage grouse plans, BLM said. Washington is going through a separate planning process. "We're pleased that the final plans are now out and moving forward into implementation," Kathleen Sgamma, president of oil and gas industry trade group Western Energy Alliance, said in an emailed statement. "Industry will continue to do its part to conserve the species." One conservation expert said different rules in each state would not benefit sage grouse populations. "You end up with a patchwork that ecologically makes no sense," said Ken Rait, program manager for U.S. public lands at the Pew Charitable Trusts. "Sage grouse don't know where the state boundaries are." Changes in the plans include removing a requirement to prioritize oil and gas leasing and development outside sage grouse habitat in Utah and Wyoming and leaving mitigation plans for offsetting harm to habitats up to states. The new plans replace 8.9 million acres, or 83 percent, of sagebrush focal areas, the most stringent habitat designation, with a lower priority designation. The plans also make it easier for drillers to obtain waivers, exceptions and modifications to lease stipulations intended to prevent harmful surface impacts from oil and gas development.